I thought it was time to get back to writing some of the more tactical articles that I was used to producing over the last couple of years, so after a couple of recent games running pure Kazaks in limited insertion, I figured where better to start than there? A lot of Kazak models weigh in at the “elite” end of the scale in Ariadna, and as a result, this makes some of them fairly straightforward to use. Generally, shoot the other guy to bits, survive, and score objectives. But one of the more nuanced choices among the Kazaks is the expensive (but insanely flexible) Scout. Of all the pieces I’ve seen used in the Kazak arsenal, this seems to be one of the models that people have most trouble with using. Often in fact, players are expecting it to perform a similar role to a simple Foxtrot FO, and they find themselves disappointed in paying the extra expense without getting any extra mileage. Today though, I hope to shed some light on the real STALKERS of the Tartary sectorial, going over what the model does, some of the tactical uses, where they should be used, and some of the pitfalls to avoid. To start with, the Scout has a similar profile to our other camo infiltrating brethren (Foxtrots, Chasseurs and SAS). For those of you who are less acquainted, that basically boils down to Infiltration, Camoflage, and Multiterrain. In addition, the SAS has Martial Arts L2 (exemplifying its melee role), the Chasseur has the incredible Sixth Sense L1, and the Scout has Marksmanship L1, giving it shock on all its weapons). Otherwise, all of them are near identical in terms of statline, with the SAS only pulling ahead on CC skill and paying slightly more accordingly. The Scout though is unique for having the only ARM (1, which is nothing special) and BS 12 (a more noticeable bump). Overall though the points cost is the biggest outlier. Looking at the common FO profile, Foxtrots cost 18 Chasseurs costing 20, SAS costing 24 and Scouts all the way up at 30. Clearly then, stats isn’t where it’s at. No, where the Scout pulls ahead is it’s wonderful array of fantastic equipment. You see, while most of the other profiles are stuck with a standard rifle on a scoring profile, the most interesting profiles for the Scout are instead equipped with an Ojotnik, a unique DMG 14 weapon with arguably one of the best range bands in the game. * That’s right folks…. +3 within 8-32″. Fantastic. On top of this, the Ojotnik is AP, and thanks to the Marksmanship Lvl1 on the Scout, Shock as well. *I know the Scout also has a Boarding Shotgun and AP Sniper profiles, but both aren’t really interesting enough vs. the competition in Vanilla to usually be worth including. As I lack much experience with either one and find them less effective than other choices, I’ll be focusing only on the Ojotnik profiles for now. Rounding out his specialist weapons, the Scout also has Mines (just like the Foxtrot and Chasseur) but he gains flexibility in being able to trade them out for E-Maulers (if you don’t take him as an FO, namely, you’re trying to save a point) and crucially, D-Charges. This lets the Scout blow open doors to the Armory rooms, complete the Sabotage classified objective, and maybe once in a blue moon blow somebody to hell in close combat. All of these point to a clear direction for the Scout – flexibility. He pays a lot more in points compared to the other skirmishers in faction, but he gains quite a bit in capability. If it’s barebones scoring, minelaying and stacking mods in suppressing you want, the much cheaper Foxtrot is definitely the right call. But if you want something that can adapt to multiple roles, cover more bases, and play a much more aggressive flanking attacker, then the Scout is considerably more effective. So far, so good then. The equipment profile of the Scout looks fairly straightforward as an upgraded skirmisher, primarily gaining a better gun and a few bits as well. But what makes the Scout stand out, and simultaneously, harder to utilize, is how to use it. First things first, the Scout is a “bully” model. For those of you in Infinity who are familiar with snipers, you might be familiar with the concept, but the idea basically is a model that excels on picking off models that are much weaker than it is. The Scout isn’t a straightforward gunfighter then, as low burst tends to make fair fights too risky and it isn’t durable enough to take a hit on the chin. Nor is it disposably cheap either, like many Ariadna models. So even if you do get into a tactically sensible fair-fight, there’s always a decent sized chance it will go wrong and you’ll lose 10% of your army quite trivially. Second of all, appearances to the contrary, the Ojotnik Scout is not a standard Sniper either. He’s decent enough at shooting, sure, but the Scout is inherently a flexible and mobile model, that wants to adapt to an evolving gameplay situation in order to get the best out of its abilities. Primarily, snipers are just too static, and not only do we have better options for them in faction, but it near guarantees that the Scout isn’t using a decent sized chunk of his toolkit. He of course can adapt to situational sniping as he carries himself around the board (which we’ll get into) but I just want to caution readers against leaving him in a firebase all day long. Finally, the Scout does not have a fixed role. A lot of models in Infinity have a single role they aim to perform all game and stick to it, but the Scout deploys with one plan and adjusts on the fly. How you play it in one game is almost unrecognizable to how it performs in another, and that adaptive mindset is definitely the primary focus of the model. Namely, abuse range bands! The Ojotnik is an amazing gun, but to get the most out of it, you really want to abuse range bands more than any other weapon due to the low burst. This weapon is unique for having a range band advantage vs. just about any other weapon in the game, so vs. Snipers and HMG’s you can hit them accurately inside of 16″, vs. Rifles you can clip them beyond 16″ and vs. Spitfires you can hit them outside 24″. So no matter which opposing model you’re fighting, you can (and should) be able to engage them in such a way that you’re always stacking the odds heavily in your favor. This flexibility, combined with the fact that the gun is essentially both AP and Shock means that the Scout is lethal to just about anything. It’ll still take some time to plink away a beefy tag outside of 32″ or just about anything with a negative modifier, but in essence, the Scout is at the very least a “threat” to almost every model your opponent can field. Really the only weaknesses of the weapon is trying to fight inside 8″ and beyond 32″. Obviously you want to avoid these types of fights where possible, but sometimes it’s just so tactically necessary that at least you have the option. In the former case, don’t forget to use your pistol! I think I’ve scored more kills with the Scouts pistol than just about any other handgun wielding model in the game, just due to positioning (and especially when the enemy model is busy dodging a mine, see below). His handgun is nothing special, but at least you still have camo and the shots still have shock, which means you can likely still stack mods and pop a weak cheerleader, especially in the back. In contrast, fights outside of 32″ are a different ballgame. As a camo model that has infiltration these don’t tend to come up very often, especially as you almost always have the option to move in closer under a marker state and get a more favorable range band. Still, if you do have to fight beyond 32″ at least you’re only on 0 mods for range. This means that unless they have negative modifiers like camo, at least you can still hit them on a 9, whereas opponents might be fishing for much lower beyond 32″ (usually -3 for range, -3 for cover, -3 for camo and maybe even -3 for Surprise Shot for that magical -12). Now 9’s aren’t great to ensure a kill (there’s a decent chance nothing will happen in a F2F roll, and most opponents have higher odds of dodging), but if it means stacking the mods so low that your opponent has to dodge with something like a TR bot, that’s infinitely better than trying to engage them inside 32″ where both your odds are better. Shooting outside 40″, TR bot opts to shoot – 37% you wound, 43% nothing happens, 19% TR bot wounds. Shooting outside 40″, TR bot opts to dodge – 44% you wound, 46% nothing happens, 9% TR bot wounds. In summary, there are a few cases where the Scout might want to fight outside 32″, so even if it isn’t a particular strength for the model, it does come up. There are very few models out there you can’t bully with the Scout at some uncomfortable range band, so finding some weaker piece and bullying it from one of those sweet spots is key to using this model. Scouts are excellent flanking models. Unlike a lot of infiltrators, they are just as comfortable at fighting decently up close and plinking models halfway across the table. However, they are just as squishy and quite a bit more in points, which combined with their less than ideal 0-8″ rangeband gives them all the more reason to avoid a quick death from many of the template weapons, mines and shotguns that tend to plague any midfield. But it isn’t just weaponry that encourages the Scout to take a flank, it’s tactics. Offensively, one of the key reasons to situate your Scout on a flank is because it gives you an easier way to circumvent the most dangerous enemy troops, and hopefully find a way around and over to start bullying some cheerleaders or other vulnerable pieces. Most opponents have fewer models eyeing up the flanks compared to the midfield, which lets you not only makes it easier to fight them one-on-one (if you want/have to) but it makes it much easier to slip past one as a camo marker (where you can always recamo if you get discovered). Defensively, the Scout can also have an easier time of running away again towards the ends of a turn. Your own left/right corners tend to have fewer eyes on them on a given turn, and it usually costs a fair few orders for opponents to go after the Scout again. If you do have valuable cheerleaders or a Lt back there, this also gives you the option of laying mines defensively, whereas a Foxtrot or Chasseur is likely to be much further away by comparison (We’ll cover mines in more detail shortly). Finally, being on the flanks is a half-decent place to watch for AD models, as markers have 360 vision (essentially), most opponents aren’t willing to take an unopposed shot to the face (straight up 40% chance with a pistol to kill an AD model landing in the open, 75% if the Ojotnik), and you can sprinkle mines again defensively if they move in close enough. Oh look, that’s the second time we mentioned mines. So I guess we should discuss them. Unlike Chasseurs, Scouts can’t start with Mines in play, but that makes them no less useful. If you’ll recall, we mentioned how the Scout has a bit of a “weak spot” within 0-8″, and Mines in many ways help to mitigate this weakness. The best way to do this is often to combine them with the Pistol, as while it’s nothing too special, most opponents would rather dodge than fight back in an attempt to avoid the mine. In such cases, your average PH 11 trooper only has about a 25% chance to dodge you (40% to dodge the mine) so you’ve got decent odds of whacking him. Because of this, if you know they’re going to want to dodge it’s often better to break cover if it means that you can clip him in the open, bringing your odds up to a comfortable 50% chance of killing an ARM 1 troop (and he could always fail to dodge the mine as well). Aside from using them as a “direct weapon”, there’s also laying mines for later on. Scouts will likely be adopting a different position from the rest of your other mine-laying models, which makes them better suited to lay mines on the flanks while other models manage the center. Because the scout has both Camo (and therefore Stealth), it’s often easy to creep around key opposing models and start laying mines around/behind them, often tying up things like link teams and wasting orders until the Mine is dealt with. This makes minelaying with the Scout very different from how you use it with something like a Foxtrot or Chasseur, who are more focused on blunting an opponent’s advance. Instead, forward probing Scouts will be trying to circumvent enemy forces and drop off mines deep in their territory, killing opportune models along the way and retreating to one of the obscure corners of the board. Next, there’s using mines defensively to cover the Scout itself. If you’re too far forward (and can’t/don’t want to spend orders retreating again) or you’re covering a particularly good long firelane, Mines can help cover the blind spots. In this sense, the mines protect the Scout more like a good sniper/heavy weapon, perhaps making it difficult to take some approach or simply making it that much harder for the nearest model to it to go and deal with it on your opponent’s turn. In summation then, if you’ve done your job right, the best threats to the Scout will have been eliminated, the mine will keep the opponent outside 8″, and the nearest model might be too weak to go and deal with it. He can now either leave it alone (in which case, you can probably go and hunt down more cheerleaders, score, kill key models etc) or some more important model will have to go and deal with it, again letting the scout “handle” a decent chunk of enemy points, whether they’re dead or not. Finally, we should make a quick mention of E-Maulers. These are a particularly dangerous bit of kit, because while a lot of more durable models aren’t nearly so terrified of treading on a mine, an E-Mauler with a bit of luck will seriously cripple one for the rest of the game by putting them in an Isolated state. Even high BTS models need to be concerned, as at most they are getting BTS 5 (halved from 9) which means failing roughly 1/3 of the time. Furthermore, if they’re HI, REMs or Tags, then the E-Mauler will also Immobilize them, potentially neutralizing a dangerous threat permanently unless they get an engineer over there. Lastly, any model with comms equipment loses that as well. In short, any high-tech model in the game is not going to want to tread on one of these, and even low-tech models that plan on not being Irregular for the rest of the game aren’t exactly fond of the idea. The tricky part with E-Maulers is two-fold. Firstly is that while the opponent doesn’t know you have them while you’re in a camo state, your information is open as soon as you reveal (e.g. deploying one) so most savvy opponents will know that this is what you deployed. Therefore you want to keep the “threat” hidden as long as possible. Second of all, the E-Mauler is sadly NOT on the FO (specialist) profile of the Scout, which tends to be the preferable option in much of ITS. That being said, if you’re running missions that don’t particularly need specialists, or you are keen to shave off a point, then they are an excellent option. Aside from being pretty decent in combat, the scout is also an excellent model for accomplishing objectives. The base profile comes with a decent price-tag, which combined with camouflage makes it pretty strong for any type of zone control scenarios. It’s easy for opponents to think that a pair of camo markers are only mines, fakes, Hardcases and the like, but when you unveil a pair of 30 point scouts it can dramatically swing the points in a zone that your enemy thought they comfortably held. Furthermore, all the most interesting Scout profiles come with D-charges. This lets you accomplish the Sabotage objective very early on given his Infiltration, as most table setups you’ll be able to pick a terrain feature right next to his deployment. D-charges also give you another option to blow up Armory room doors on scenarios with central rooms, as well as do things like destroy Nimbus Antenna if you have the chance. Finally, Scouts have the excellent FO profile, which I’ve mentioned a few times throughout this piece. This turns the model into a specialist, allowing you to score most standard objectives. On top of this, you also gain the marginally useful “Forward Observe” skill, which lets you mark targetable objectives you can’t get to and bomb them with missiles instead… not to mention the usual uses of the skill, especially things like buffing Spec Fire. Lastly, being an FO gets you a Flash Pulse, giving you even greater weapon versatility. Many decent models out there can’t be killed so easily with an Ojotnik, but stunning them with a decent roll via Flash Pulse can be incredibly useful in a pinch. So as we already discussed in the positioning section, the Scout wants to be taking a flank, which makes it ideal for both grabbing objectives over on the side and forward observing targets behind enemy lines. Usually if you want to go for anything more central, you might want to divert a different closer model to the task, but doing things like blowing the side doors of a central Armory room isn’t exactly out of the way for where the Scout wants to be. Otherwise, as they’re pretty flexible models, they can still go for both yours and the opponent’s more central objectives, but just be wary of getting into close-range “fair” fights, and decide if it’s not better to send a cheaper and more disposable model for the task. Finally, the Scout has the option of being your armies Lt, which is currently the only option to get a Camo Lt option without spending any SWC, even if it is a fair price tag. While most Lt options you buy in Ariadna will undoubtedly be squishy, being in a camo state negates this nicely, forcing most opponents to spend usually another order to get to you first (to discover you) and making it harder to kill you once they do (factoring in the -3 from camo). He can also lay mines for his own protection, detonate D-Charges safely after others lay them, and because the Ojotnik is such a flexible weapon, he can usually contribute to a fight from a safe distance without over-exposing. Really the main downside here is cost. The Scout Lt weighs in at a hefty 29 points, which is more than every other camo Lt option currently. Furthermore, a lot of this cost is going towards equipment and abilities he may not necessarily use, as an exposed Lt like this is likely to get killed pretty quickly as soon as your opponent discovers he is your Lt, given the inherently fragile nature of the Scout. So why might you want to do this? First of all, during the last turn of the game you don’t care about Loss-of-Lieutenant, so there’s always at least one turn where you’ll get some mileage out of him, even if you do play him cautiously tucked away all game. Because the Scout has a long range weapon in the Ojotnik, once you do bring the Lt into play, he doesn’t exactly have to play catch-up keeping pace with the rest of your models on the board, and revealing a last minute decent ranged weapon from a piece that was inactive all game can quickly swing things in your favor. Second of all, certain scenarios and situations help to mitigate this risk. Chain of Command is the obvious inclusion, and while Ariadna only has one source of it outside of SpecOps events (The Unknown Ranger), the option does exist. Scenarios like Decapitation also make your Lt obvious anyway (and remove the LoL penalty if he dies) so many players enjoy having a more active Lt and the protection of camo in these cases, rather than the usual shell-game of cheaper troopers that you cannot mask the Lt’s identity with so easily. 1.) The Foxtrot, who while much cheaper in points (17) costs a massive 2 SWC. This means you have some trade-offs to make, as some lists have a lot more of one than the other, and eating up a third of your SWC for a simple rifle is not a decision most take lightly. 2.) The SAS, who is nearly exactly the same, but 5 points more and gains some melee power. Unless you’re always getting your Lt into melee (and note that most dedicated assassins will still probably beat you out) this is definitely a profile to avoid. 3.) The Tankhunter, who costs 25 points but still 1 SWC. He gains in durability, WIP (good for the roll-off) and Courage over the Scout, with most of the weapons being a debatable trade. Again, like the Foxtrot, really this is just about trade-offs, as both are good options. 4.) Bruant, who while strictly speaking only Limited Camo (which doesn’t tend to matter if you only plan on using him for a single turn) and costing 1 SWC, is still one point cheaper and brings a real heavy weapon to the party in the Molotok. This generally makes him a slightly better gunfighter, but of course you pay for it and lose some of the weapon and model flexibility in the package. Overall I’d say the Scout compares very fairly with these options as a viable alternative, and the only one without SWC cost. Even though he is the most expensive option, this doesn’t have to be a bad thing, with both surviving army point/zone scoring scenario possibilities to consider and Limited Insertion now being an ITS option that makes more expensive Ariadna models inherently desireable. It won’t be an option you reach for every game, and indeed many like myself still prefer the cheaper Line Kazak profiles for overall cutting of costs. Nevertheless, if you enjoy the flexibility of the Scout and are looking for a better way to protect your Lt, then it might be a choice to consider in your next game. In conclusion, Scouts are a very flexible model that some opponent’s struggle to get enough use out of, but I hope this article shines some light on some of the more subtle ways to utilize this piece. Trying to use them like other (read: cheaper) midfield camo infiltrators usually isn’t the way to go, so instead you want to position them further over to the flanks and make use of all their different skills to make the most out of their bigger price tag. Anyway that’s all from me for today, but hopefully I’ll be back soon with some more tactical advice on getting the most out of all your infinity models. Once again, I’m back with another painting update. As some of you have no doubt been following, MidnightCarnival and I have been having ourselves a little wager. The plan was simple – paint 25 models by the end of the year, or buy the other a chunk of models for their new army. Anyway this post comes a little later than I’d hoped, but the combination of moving house and getting a new Husky pup meant that real life had other plans entirely. – Bark bark! A real Antipode Jr. this one! Fortunately for all of you, this delay in posting actually means I’ve completed more models, including an entire Grunt link! These models are definitely in the newer style for Ariadna, sporting combat sweaters, newer looking weapons and some really neat other details that gives the link a lot of character. I had a lot of fun painting this lot, and with only a few more US models to go, I’m quite pleased at the pace I’ve got with these guys, even if painting similar models is getting a touch repetitive. And speaking of links, next up is my last remaining Volunteer, who I picked up around the same time as Isobel to finish that link team as well. Bringing a hefty HMG is really sweet and a solid way to get dirt cheap firepower buffed with all the standard link team bonuses. Only one more surprise guest to go for this link, and that’s 2/3 link teams done for me! Finally, we have another Scot, the diminutive (but undoubtedly badass) SAS. For whatever bizarre reason, this sculpt was definitely released during Corvus Belli’s “small scale” period, as he sits a full head lower in size than most of my other sculpts, making him approximately 4.5 feet tall? Of course I’ve affectionately given him the name “Mouse”, and the gentle ribbing he gets from his teammates as a result only serves to fuel his kill drive as he’s been diving deep behind enemy lines and blazing away with an assault pistol, meleeing an opponent’s Lt in another game, and scoring countless objectives when fielded as a Forward Observer. These guys are so useful when playing Scots that I have gotten myself a 2nd, with pics to follow when I have a chance. Anyway that’s all from me folks, and with another 9 models down that leaves only 8 to go! I’ll also be attempting some more tactical related content in the future, so for any of you budding infinity players out there, keep your eyes open! Last week, I managed to get 2 games on that magnificent space table, so I wanted to take the chance to do another battle report for my second game. To keep things simple, we kept most things pretty much the same, with the same table, scenario and the same list on my part. 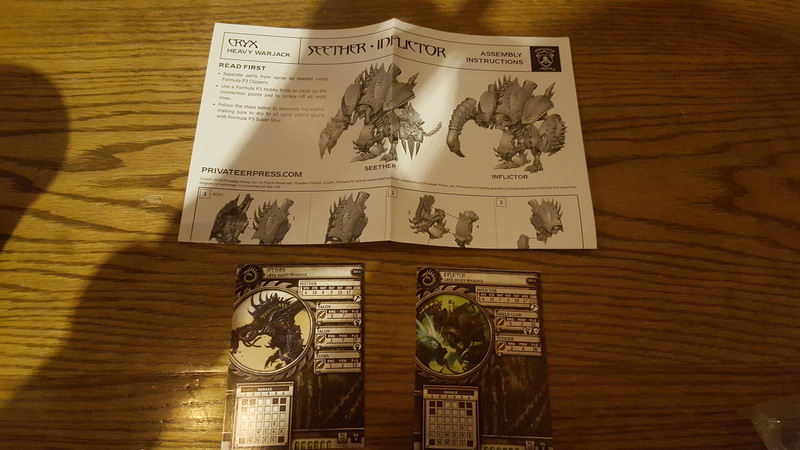 Here is the first battle report for those of you who missed it, and I encourage you to check it out if you want to see more images of the overview of the table. My list was exactly the same, although at least this time I was more familiar with the list so I think I generally put them to better use this time. My opponent’s list was both incredibly thematic, and rather off-the-wall at the same time. Considering this was a space table with a lot of Zero-G, both of us agreed it would be really awesome if he ran the Santiago link in Military Orders. With a chance to actually use those weird terrain skills, how could he refuse?! 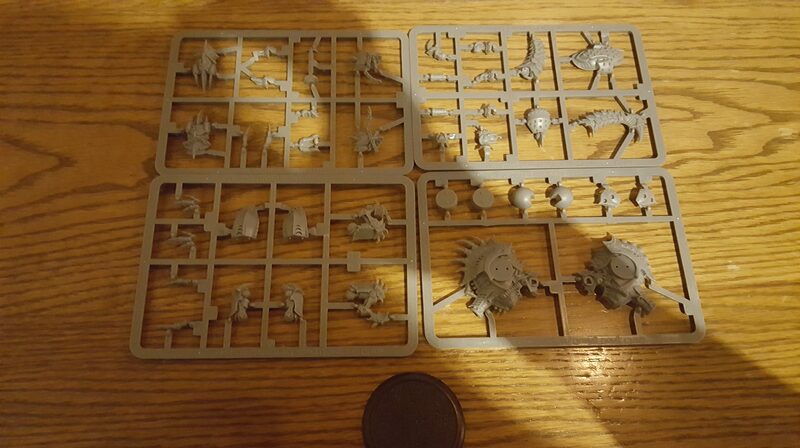 Only 8 orders and 2 SWC spent was a bold decision, but on the flip-side, a big mass of heavy infantry on a clustered board like this one and a central room meant this list would be a real challenge to overcome. Next we drew Classifieds – I don’t recall what my opponent got as he didn’t complete either, but I drew Sabotage (selecting the green building on the left this time) and Telemetry. My opponent won the roll-off, so he opted to choose turn order and left me to pick deployment. This time I opted to switch sides from my last game, thinking I could use the better firelanes with my big guns on this side and hoping he would leave me with the second turn so I had a last-ditch effort to dislodge that mass of heavy infantry from the central room. Here you can see the end of my opponent’s deployment, with the big mass of Joan/Santiagos on the left, the Hexa proxying a Black Friar just behind them, the Fusilier Paramedic behind the building and the lone Father Knight over to the right. My deployment was understandably a bit more conservative, with the HVT and one Scout in the green room to the left, Le Muet covering a long fire lane just behind them and a Tankhunter HMG ready to take his place if need be. In the middle is the fake marker covering another fire lane, the big Antipode pack and Controller at the back, with the Veteran positioned in the little blue room to make a break for the central room. Finally over to the right you can see the Spetznaz in the purple room, the 2nd Scout positioned over by my console, and lastly, the Tankhunter Autocannon covering another lane the Santiago link might use to advance (just off-screen). Largely I was hoping to position models to make it difficult to move up the link, hoping to pin them down and keep them out of that room as long as possible. To this end, I stripped him of 2 orders, and we were away. The Father Knight began the proceedings by quickly stomping up to the objective, buckling somewhat under the weight of Zero-G movement and failing his first attempt, costing a full 3 orders to turn the console and occupy the green room. With a crucial need to get the hell out of that opening platform, the Santiago link stomped up, turning the Spitfire quickly on Le Muet. My opponent knew that the ODD and cover would make it difficult, and matters were only made worse when we measured to find him just out of optimal firing range and I could catch him in the open. Even though he needed 5’s (BS 17 in a 5 man link, but -12 for range, ODD and cover), 5 dice vs. 1 still proved to be enough, as Le Muet’s shot flew wide and he landed a lucky Crit to break his Symbiont to boot, knocking off the ODD. Divine Guidance indeed! Still, with only a couple of orders remaining and not fancying pushing his luck, he opted to move Joan and a few other models closer to the central room, ready for the next turn. Vowing revenge, Le Muet clipped him with another shot out in the open, this time favoring the odds with at least 2 dice vs. 2, even if his ODD was gone. One shot was cancelled by the Dodge and the Santiago passed both ARM rolls from the Double Action ammo, proving that the Santiago was still blessed with some kind of sacred ward. Having had enough of this silly fight I opted to move up the Tankhunter HMG in his place, stacking camo, Burst 4 and surprise shot in my favor to finally blow the Santiago into pieces and resolutely break the link. It was time to position the rest of my forces, needing to sort both of my objectives before I even tried to take that central room. I started by having both scouts score my respective objectives, even iif it took a couple of orders to do so. Next I began coordinating the Spetznaz and Tankhunter further over to the right, moving Le Muet to cover the green room door from the impending Father Knight and bringing the Veteran up to the central room. The Tankhunter had a perfect bead on the rest of the Santiago link, and even if he hadn’t opted to hold his ARO (vs. a camo marker), the range band difference and camo meant that I felt pretty safe, even out of cover. With only a few orders to go I opened the room up with the Veteran, ducking inside behind the boxes and positioning the dogs not far behind him. As my last order I decided to put up some suppressing fire, with the Tankhunter and Spetz both hoping to force my opponent away from the objectives on my side, the Veteran holding his own in the central room, and the Antipode controller joining in the bullet parade for a laugh. Of course the inevitable was coming, and the remaining Santiagos pressed on with Joan’s coordinated order. The Autocannon opened up and miraculously the Santiago survived with a dodge (! ), making it to the right door of the central room intact. He quickly fire off a burst of nanopulser into the Veteran, hoping to take advantage of the lousy Ariadna BTS. Thankfully his luck ran out, and the Santiago lost a wound to a flurry of suppressing AP rounds and my Veteran survived the blast of nanobots in turn. Next it was the Paramedic’s turn, and the shifting luck continued for my opponent as she promptly failed to help the downed Santiago spitfire and watched him bleed out helplessly instead. – I thought you said you WEREN’T a trauma DOC?!! With only a few orders to go, the Father Knight began his rampage. A blaze of bullets were exchanged at the entrance to the green room without result, so with another order, he assaulted the Scout and chopping him clean in half. The move was not without consequence though, as one of Le Muet’s breaker pistol shots found it’s mark and dealt a wound, and at least I managed to get a mine down before the Scout found a fast-track up to heaven. My opponent ended his turn with a coordinated order, bringing his Paramedic Fusilier closer to his objective (I can’t remember if he made it and flipped it or not?) and repositioning a few models near the door. Again, a Santiago attempted to dodge the Tankhunter but he wasn’t so lucky as his predecessor, exploding into showery pieces among the hungry stars as the heavy rounds hit home. It was my turn again, and although I still barely held that central room, there were more heavy infanntry just outside and a Father Knight bearing down my left flank that would have to be dealt with. Quickly my dogs piled into the room, my opponent opting to hold his ARO as the looming camo markers approached. This suited me quite well as I opted to spread my markers out as much as possible to avoid templates catching several all at once, so they positioned all around the lonely Santiago. In the couple of orders they charged in and the whole thing became a bloodbath, with the Santiago and Black Friar just outside blasting nanopulsers at the slavering hounds before the Santiago tried to desperately fend them off in melee. It took a couple of orders to do so and their lives, but the Antipodes fought through my opponent’s surprisingly hot dice and eventually brought the brave knight down. When the smoke cleared the Knight was unconscious along with 2 of the poor pups, leaving the last one immobilized in what could only be described as amazement. Next, it was time to do something about that Father Knight. Le Muet and him exchanged a volley of Breaker Pistols, but 3 dice to 1 eventually brought him down and my alien sniper redeemed himself in the end. Now free to act, the Veteran laid his sights on Joan, catching her in the open and spending my last few orders to bring her down. Three heavy infantry unconscious and I had bought some precious time, dropping his Lt in the process. It was his last turn now, and with a small stack of command tokens left at least he could afford to make every order regular again. The Black Friar advanced into the room, lobbing a Drop Bear at my Veteran before nailing him with the combination of her rifle and the subsequent explosion. That left the central room entirely unoccupied, and she laid down another drop bear for good measure in the doorway in order to make it difficult for me to respond. If I couldn’t take back that central room I think I was likely done for, and there was only one model even close enough to try, my second scout. With a couple of orders remaining, I had to be careful about how I pulled this off. Rather than trying to push through the front entrance I instead sent the Scout around the side instead. It cost me a couple more orders trying this approach, but thankfully it let her get a bead on the Black Friar and drop him before following up with a Forward Observe roll to score Telemetry (+1 Point). More importantly though, the Scout had the tiniest sliver of room just inside the doorway behind the downed Santiago, so he crept up carefully with a knife clutched tightly to his chest. Because there was no way for the mine to clip the Scout without also touching the Santiago, the scout smiled as he circumvented the deadly but surprisingly “humanitarian” explosive, snapping the Knight’s neck in two and keeping very still as he waited for reinforcements to arrive. The room was ours (securing the nearby HVT), and with the Engineering Deck held once again, my Kazaks went 2-0 in victories for the day. – Stay very still…. Minesweeper Muls will be here shortly! I hope you all enjoyed the write-up of this second battle report, and with any luck, I’ll have a chance to bring you more games in the future. So it’s time for another battle report! Once again, my opponent and I were pretty fortunate to play on a pretty spectacular table. After playing a number of games on some pretty “same-ish” boards, we opted to run something a bit different, and came up with this rather interesting space station board for me to return to my Ariadna on. As you can see from a few angles of the table, everything is nicely divided between indoor little rooms (treated as normal terrain) and the “outdoor platforms”, which we treated as Zero-G. What this meant is that all normal models could NOT Move/Move, meaning they were restricted to skills like Move/Shoot, Move/WIP and so on. Furthermore, just for a bit of fun, we decided to give ALL models both the Super Jump and Climbing Plus skills when outside, and any models that already had either of those skills or the Zero-G terrain skill/Multi-terrain could ignore the movement restriction. Really this only came up a couple of times to help models get around out in the open, but I’m sure if we played on it again, we would have noticed far more tactical applications! The scenario was Engineering Deck, which felt oddly appropriate and gave a nice balance between trying to take the central room and still pushing up the flanks to circumvent the enemy. Anyway in celebration of this special occasion, and after promising more Kazak coverage on the Ariadna forums, I decided to run with something particularly challenging – a (mostly) Kazak list**! Despite not having an actual sectorial and being already restricted by the “Limited Insertion” rule of the scenario, I thought this would be a particularly exciting way to play this game. The fact that all of my models were painted also made it quite appealing as well! **I say mostly Kazaks, as I did run Le Muet in this battle, given that I lacked enough high point Kazak-only models to run for Limited Insertion! My opponent had an equally nasty surprise waiting for me. This time he was running Vanilla Aleph, and cleverly noticing the house rules we had laid down, opted to run a Marut! The multi-terrain skill largely meant this thing could stomp around unhindered, and the combination of the MSV2 vs. my camo, Multi-HMG for the open areas and the Heavy Flamer to empty out the rooms had me worried. It’s a little tricky to see from the map given all the camo markers, but I’ll do my best to explain. On the left hand side I had a Scout (by the box) and the real Spetznaz guarding the door. Further back in the little blue room I had Voronin, with the Tankhunter Autocannon standing by the entryway to his room. Up at the front was the Spetznaz’s fake marker, with the Veteran Kazak inside the blue building ready to take the central room. Le Muet, the 3 Antipodes markers and the controller sat behind the blue building, ready to reposition quickly. Finally, on the right side, the camo marker in the green room represented my second Scout, the Tankhunter HMG took cover behind the console, and my HVT sat at the front of the big blue room. Here was my opponent’s side of the table. At the bottom sat the Marut, with the Myrmidon standing behind it to provide smoke and Thamyris nearby to protect with hacking options. In the middle was the Posthuman Mk5 by the room, a Minesweeper Probot and a Dakini HMG, ready to adjust to the evolving tactical situation. Finally at the top was the Posthuman Mk1 Engineer (barely visible behind the building) a Zayin TR HMG bot, and a pair of Netrods that deployed on the edge of the table for this slightly amended scenario (placed on the edge of the table, like Cold Sleep). My opponent stripped me of 2 orders, and we were away. Knowing that I didn’t want to get stuck in a fair fight and play into my opponent’s game, I moved the left Scout up through the Orange building, switching over my console on the way. Eyeing up those Netrods from the start, I first had the TR bot to deal with, so I recamo’d and crept to the edge of the pink room door. I couldn’t exactly hit it in “bad range” but, straight dice for me (+3 Range, -3 Cover) and -9 for him (Camo, cover, surprise shot) at least ensured that he needed 5’s in return, even if he had way more dice than I did. When I rolled a 1 and a 19 though my heart sank, thinking it was over. Thankfully, all of my opponent’s shots missed, so my Scout successfully put the bot down! Now free to proceed unhindered, he put both Netrods down (just cut off to the left of that previous shot) with his pistol and kept on ruthlessly pushing up the flank… with Multi-terrain ignoring the penalties imposed by Zero-G! Along the way, my Scout spied the Minesweeper Probot over on the side, slamming a couple of rounds into it’s side and knocking it unconscious. Running out of orders, I did think about trying to kill the Posthuman (risking a nanopulser to the face) or WIP the console (which he’d only take back right away). But given how early it was in the game, I figured there were easier ways to make things hard for him. Instead, I opted instead to coordinate a couple of my guys up closer (the Spetznaz, Tankhunter Autocannon, Scout and Le Muet) to get them further up the field. Finally, my Scout my crawled over to step on the broken remote (achieving Extreme Prejudice for a guaranteed point) and hid in the corner to end my turn. It had pretty much my entire turn on the Scout, but my opponent was already down 4 orders and risked losing a couple more if that sneaky little Kazak wasn’t dealt with soon. The Marut powered up and began stalking the open platforms, spying the forward camo marker along the way. It opted to Discover and successfully passed, cursing the Spetznaz’s fake and continuing the search for real prey. It didn’t exactly take long for my opponent to find the real one though, blasting it at the edge of the orange building and sadly tearing him in two. Turning around the Marut found the Scout, hosing him down with the heavy flamer successfully but not before he had time to lay a mine. I did think about revealing the Tankhunter to ARO the Marut as he crossed the gap, but by this time my opponent’s pool was already low on orders, so I knew it was more important to deprive him. Knowing he had to at least get out of the open then, my opponent tried to Discover the Tankhunter on the platform (this time failing), set off the mine (it did nothing to its ARM 8!) and opted to hide behind the main Engineering building. 2 models down to my opponent’s 4, and even if I felt like the Spetz’s death could probably have been prevented, I was feeling in pretty good shape. This time it was time to activate the second Scout, pulling back to activate the second console on my side before returning to pretty much his original position. Noticing that my opponent wasn’t really covering his green room, my Scout crept slowly inside, laying a D-Charge at the door (for Sabotage) and attempting to WIP his objective. After failing multiple times, much to my frustration, my Scout laid a Mine at the door instead, knowing that Myrmidon would likely want to close with me on his turn and would be more than happy to cleave my poor 2nd Scout in two! Finally it was time to coordinate a few of my guys around, including the Scout, and this was when my opponent opted to reveal his nasty TO – a Posthuman with a Boarding Shotgun! Thankfully my Scout was the Spearhead leader (thinking I’d try to WIP that silly console one more time along the way!) so he desparately fired his pistol in return. Somewhat miraculously, my opponent rolled a 17, missing the Scout and actually losing the face-to-face roll as a result. Failing the armor save and cursing the Scout having Marksmanship Lvl1, the Posthuman dropped dead straight away, much to the shock of everybody, including my Scout! The mine however did nothing (even though it probably should have killed him anyway), so I guess either way my opponent’s Posthuman was likely to go down. It was at this point that one of our other regulars raised an interesting contention, and it was something we discussed extensively after the game – why did my opponent not reveal his TO earlier, perhaps say, when I was Move-Moving inside the room (so he could nab me on my second short skill). Now as it happened, neither one of us had actually noticed that it was my second short skill that I entered the room with (and thus LOS), so neither one of us even spotted that this was indeed an option. In fact, this was almost certainly the better bet to avoid the mine I dropped later and take me out with an unopposed roll. Really I should have been less careless if I’m honest, as there was no need to have made such a mistake and taken the ARO risk of a possible TO! But as my opponent rolled a 17 on his dice, thankfully it didn’t matter either way! Things were getting a bit difficult for my opponent, and it was time for a bold plan to turn things around. He could probably deal with the second scout quite trivially, but he wasn’t getting any closer to the objectives and my order pool was still very much intact. Instead he decided to continue leaning on the Marut heavily, leaping across the platform with a gravity defying leap and attempting to Discover the Tankhunter for a second time. Again, my opponent failed the check, much to his frustration so of course I opted to keep the powerful Tag hunting weapon hidden to avoid its wrath. The powerful Tag then wheeled around to fight my Veteran Kazak at the door, washing him with the powerful heavy flamer and stomping dangerously close to my backfield. The Kazak successfully clipped him with a wound during the first exchange (AP rounds ftw) and survived the burning flames, but then cunningly my opponent pushed his Tag deeper still, catching BOTH the Tankhunter (still in camo) and the Vet Kazak in the blast. It was then that my luck ran out entirely, with both models dropping unconscious but not before I dealt him another wound. Finally, my opponent spied the almost helpless Antipode controller, still unfortunately positioned right behind the slew of still camo’d Antipodes and therefore an elligble target for the Flamer. The dogs all dodged with ease (PH 15) and she miraculously did the same, scattering the pack with a slew of 4″ dodges and thankfully keeping them spread out enough to avoid a repeat experience. My opponent knew that he was probably done at this point, but he backed off with his last order, whacking each of the dogs and the controller with the multi-HMG and they all successfully dodged again, one of them even managing to Engage his Tag in the process. At this point even I felt sorry for the dice betrayal of my opponent, but not sorry enough to still leave the Marut standing once my turn rolled around. The rest of the pack quickly closed in, the Marut quickly dispatching one of the dogs in melee but being torn to shreds quickly by the others. Losing his last offensive piece and his lieutenant, my opponent was happy to concede. He was a bit disgrunted at not being able to flambee the little dog pack, which even I expected. However, with the second Tankhunter over on the right side in a pretty prime spot, I think I could quite possibly have finished the job either way given the final position of the TAG. Infinity is a wonderful game. But the more you play it, the more you realize how important terrain is. Sometimes though, the discussion of placement practically supersedes any conversation about what type to play on, and for such an imaginative terrain-based game, some of the boards I’ve seen have just been, well, boring. But my latest game yesterday was on a board I felt was so magnificent, I simply had to share it. And with that comes the first (of hopefully many) Lazarus infinity battle reports! That’s right. Not an urban building, neon sign or car in sight. Now I know what you’re thinking…”That board is WAY too open” but even then we came up with a crafty solution. While in the river, all models would count as prone. This meant that they obviously moved slower (although we said models with aquatic terrain could ignore this penalty) but it let them duck pretty low out of sight from models blazing away across the table. Perhaps more importantly though, any kind of height advantage, such as being on a bridge or in a building, would let you shoot “down” at the models trying to cross the river, so you weren’t completely safe either. But wait Lazarus, that’s not Ariadna, you might say. And you would be right. 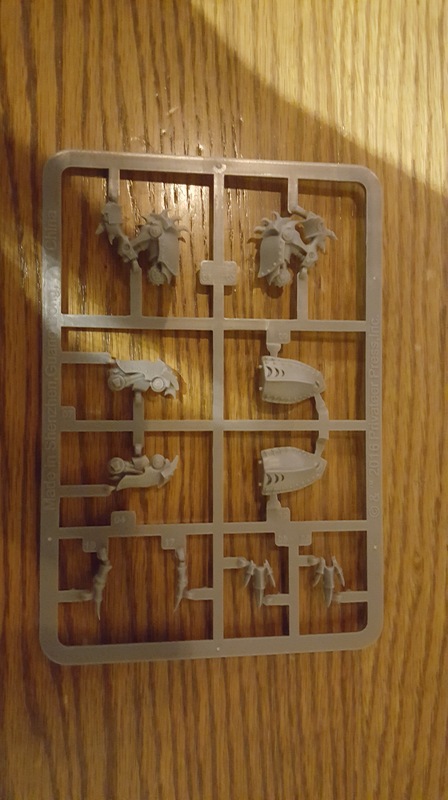 For I’ve been slowly branching out into another faction, Pano (well, Neoterra strictly speaking at the moment), and that’s something I’ll no doubt be showing you all as soon as I’ve finished my little wager on the site and have a chance to paint them. Unfortunately though, that did mean there were a few proxies. My Fusilier link was representing the Bagh Mari, my Aquila is the Orc Lt, and I personally use the Commtech as a Machinist (engineer) and Bipandra as the Trauma Doc (doc) as I don’t really like those official models. And here is my opponent’s list. A nice slew of ranged shooting power which was probably a good idea on this board, some lethal close combat, and still a few key scoring models. Very snazzy. He went on to promptly ace the rolloff, and quickly chose deployment. This was a sneaky move on his part as going 2nd is probably the advantage in this scenario (last turn scoring) but he knew that if I had to choose turn order going second, he’d have all the deployment advantages against me. So I opted to go first, and hoped a bit of board control would swing the odds. Here you can see my deployment, with the Tikbalang being slapped down last as my reserve model on the right of the house with the Orc and Machinist, the Bagh Mari link over on the left with the Doc, and the Remote in the middle with the Palbot. Really my placement of the Tik wasn’t quite “optimal”, but the idea was generally to try and speed bump his Myrmidon link and let my Bagh’s run rampant over the other side of the table, trim his order pool, and score. And here is my opponent’s deployment, with the Myrmidons behind the Red-roofed building, Netrod scattering into the open and the Thorakitai behind the riverbank by the trees. We discussed this after the game that he perhaps should have put his Thorakitae link IN the river at the start, rather than behind the bank. It was a tactical trade-off, as this would have let them get behind the mill sooner for fewer orders, but of course might have left them more vulnerable had I been able to use the height advantage from somewhere to pick them off. Of course he didn’t know I had a Climbing Plus Tik in reserve heh, so maybe it was the right call? Otherwise the rest was fairly standard, with the HMG bot he reserved opting to skulk a little further back for fear of being picked off quickly by a sniper, especially as there were few good spots to put him. He stripped me of 2 orders and we were away. So first of all, Tik went up and slaughtered the Netrod, before spending a few orders to stomp across the bridge and lay a mine roughly at the corner. I did think seriously for a moment about pushing the attack and going in hard with the heavy flamer, but at that close distance I was likely to simply get engaged and chopped to little pieces. Perhaps more importantly, I needed to get my Bagh’s up on the other side, so I advanced them quickly into the midfield and took up some aggressive positioning around the bridge. A few orders later and my Sniper drew a bead on both the Zayin TR HMG bot and Hector, but the extreme distance gave her a massive dice advantage, even splitting her burst. The remote predictably went down, but Hector safely dodged his bullet and skulked further back out of view. Realizing I was running low on orders, I coordinated the Tik a lot further back to a safer position, and used the opportunity to move up my Remote and doctor to where they might be a touch more useful. Over to my opponent then, and he was down to 9 orders (Hector having Strategos). The Myrmidon hacker popped some smoke off to cover the gap between the bank and the building, and then the team quickly piled inside. Very carefully they traipsed through the interior so as to avoid the mine, and then hector came out the other side to begin fighting the massive tag. With 6 orders to go, my opponent contemplated (and we rolled it out to see) blazing away with the Plasma rifle, as needing 13’s was pretty good, even if I was ARM/BTS 6, meaning I had to roll above 8’s to survive it. However, more problematic was that I could simply fry him with the heavy flamer back in turn, and as I said, we rolled it out and he ended up charred 2 orders later while I was down to my last wound. Instead then, he opted to use the safer play of popping smoke, catching the tag in the cloud and moving Hector up to carve it in two. Thinking he would need about 5 orders for the job (1 to smoke, 1 to get there, 3 to fight vs. my decent ARM and STR) he had his Thorakitae team try and move up a bit, with the Feuerbach picking a fight vs. my sniper. Unfortunately the odds were very much in my favor here, as the 5 man link team and catching him in the open meant I needed 18’s on 2 dice, while he had 3 dice needing 12’s (also in the open, but I had Mimetism). The sniper hit home and killed his Thorakitae, temporarily breaking the link before he reformed it again on Thrasymedes. Returning to Hector then, my opponent figured that with his high CC, high PH and crucially, an EXP close combat weapon, Hector had pretty good odds of smashing the Tag. Although the fact that I was CC 17 myself and AP meant that I managed to make a pretty good fight of it and caused some of his dice to miss. That, combined with the low number of orders left meant that I actually survived the fight with a single wound left. This is the key issue with melee combat in this game – even if you have all the skills in the world, it’s still 2 dice (Martial Arts Level 4) vs. 1, and you can always roll those low numbers. And roll those low numbers he did, with me actually winning one fight (dealing a wound) and him only getting 3 hits on me in turn. 9 dice, needing 8+ to survive, so yes, it was a bit below average that I lived. My opponent was understandably a bit upset at this point, but his luck would change soon enough. My turn comes around and the poor battered Tikbalang is stuck there, so I sent my Orc Lt in to try and dig him out again. Some of the Myrmidon link team members were really out in the open here (in the river) so I figured if I could get him on the bridge and try to pick them off, that might deprive him of some orders as well as scoring in that zone. Perhaps more importantly, that would leave the nearby Machinist safe to walk up to the Tik and try and fix him, again hopefully depriving my opponent of more orders to simply kill the thing. Unfortunately though this plan fell far short, with Machaon, my first intended victim, successfully passing his Smoke roll and shrouding most of them in fog. My Orc, sighing with frustration, clambered up to the side of the bridge and dropped prone, before spraying Phoenix, the only one not protected by the smoke, right in the back. Of course bloody Sixth Sense level 2 (from being in a link) meant that he too passed his dodge smoke, and with that, the plan was over. My orc used his Lt order to go in suppressing fire (hoping to suppress link team members if the team activated to fight the Tik, and hoping to stay alive…) and that was that. Over on the other side of the board though and I was much more successful. My Bagh Mari team moved up, crossed the river to the far bank, and introduced Thrasymedes to my favorite new friend – a link team boarding shotgun. +6 for range, +3 for the link team, and only -3 for his ODD (gotta love that sweet Bagh Mari MSV1!). I can’t remember he tried to fend me off with the SMG (I was in the open after all, but I did have Mimetism) or hose me down with the nanopulser, but either way I survived and all the remaining Thorakitae dropped. With only a couple of orders left I repositioned the team to a better midfield position and waited to see my opponents retaliation. His turn rolls around, and Hector, sick of his ongoing combat with the tag, breaks out of the link so that I wouldn’t suppress the other members with my Orc. He quickly dropped the TAG in a single order, smashing it to pieces with all 3 dice and finally putting the odds back in his favor. Not in the order he wanted mind, but hey. With only 4 orders left he then turned on the Orc, but not being able to reach it in melee and no longer being in a link, it wasn’t exactly an easy fight for him either. In fact, with both of us rolling 3 dice and him needing 10s (+3 range, -3 for cover as I was prone and above him, -3 for Suppressing) and me needing 14s (suppressing him in the open), I actually ended up dropping him. Only 2 orders left and only 3 models on the table and he conceded, knowing my Baghs had complete control over the other side of the table and could happily reposition to come after the remaining Myrmidons. Really I felt like my main mistake was with the Tik. What I should have done with him was actually pretty simple – put him pretty much where the Orc was standing on the other side of the bridge(using dat Climbing Plus yo!) and go on suppressing instead of moving further back. That would make choices difficult for my opponent, as I could suppress him if he tried to shoot me from the building (I’d only be at -3 needing 12s, he’d also be at -3 overall due to my Mimetism and Suppressing, needing 10s) and closing with the Tik would be damn near impossible for melee combat or at least more costly to do so. It also would have meant the link team could have potentially added supporting fire and chew up more orders needing smoke to cover the advance as a result. Otherwise, deployment could have been better, but it was certainly a tricky board to eyeball and of course I was deploying first. Tik would have been far better hunting down the Thorakitae, whereas the Baghs should have been more central to go after the Myrmidons no matter where they went. On his side of things the main issue was the placement of the Thorakitae as we said, and while my opponent was initially happy with that choice of side, the lack of deployment zone cover didn’t make it easy for him when I was going first. Anyway I hope you all enjoyed this feature, and if it proves popular, I’ll try to take more pictures and write up reports of some of my weekly games. Next time I’ll probably run some Kazaks (who are fully painted by the way!) so that should be a lot of fun! It’s here! After a wait of entirely too long, and an edition change, we finally have the Inflictor/Seether kit! 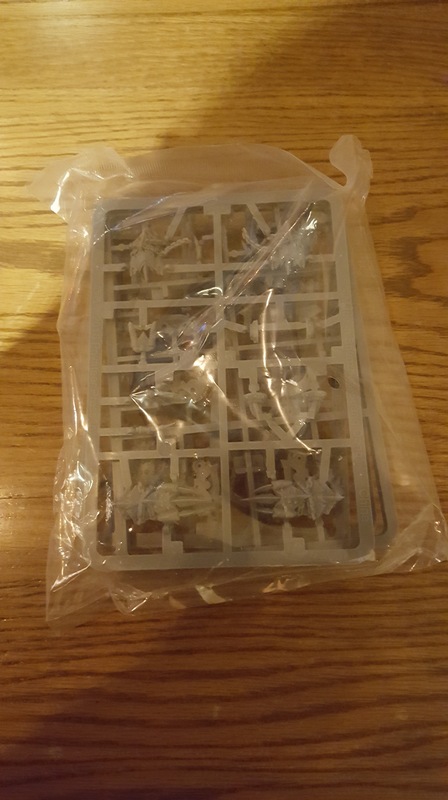 Here’s a quick unboxing before I get to assembling it! It all comes neatly packaged inside a little plastic bag. Remember, bags aren’t toys, don’t let your pets or infants get at them. 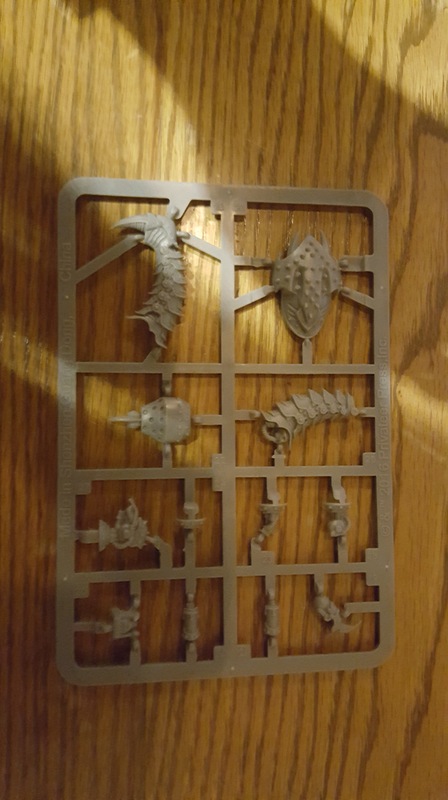 The first sprue is the torso. It comes in 2 halves much like all of the torsos do, and I have to say, I much prefer having to assemble the torso halves while they use a higher quality plastic instead of the spun plastic that they were using previously. Next are the legs and shoulder plates. The feet are separate, and at first glance, looks like they may only fit in one position. Nothing a little bit of modelling putty and an exacto knife can’t fix if you want to adjust the position. Not just that, but it appears to be relatively easy to adjust the position of, or perhaps to make it in a running pose. Here we go. 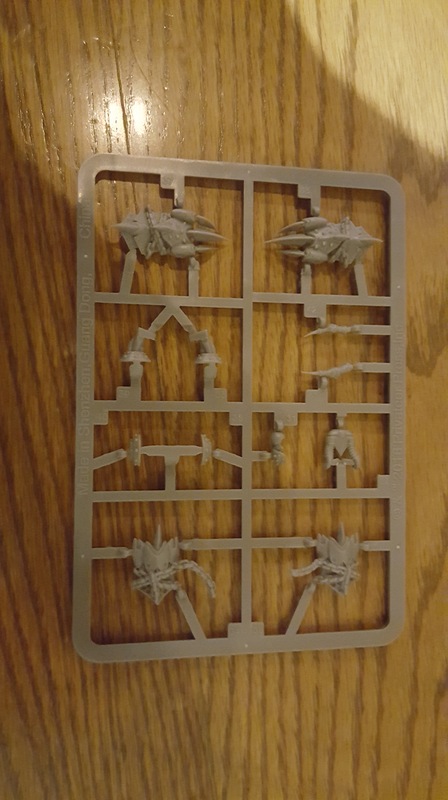 This is the sprue I was waiting to see. 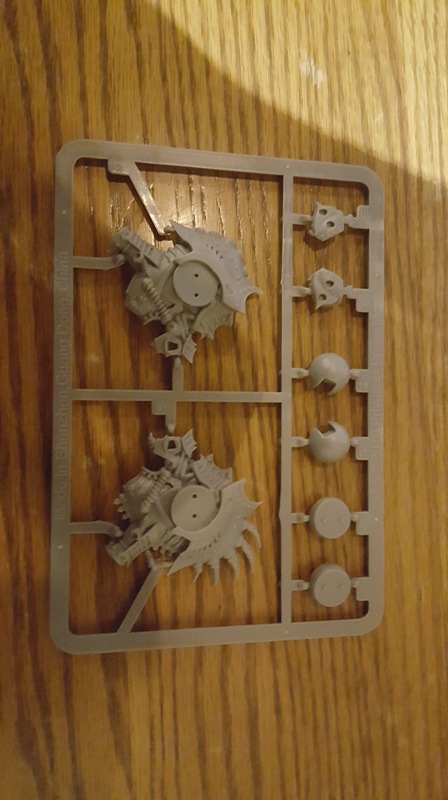 Inflictor parts! The clock wasn’t reset! It wasn’t a troll box either! It really does exist! I suppose I should at least mention that the Seether parts are in there too. I still don’t like the Seether, but that’s not the point of this post, so I’m not going to get into that. 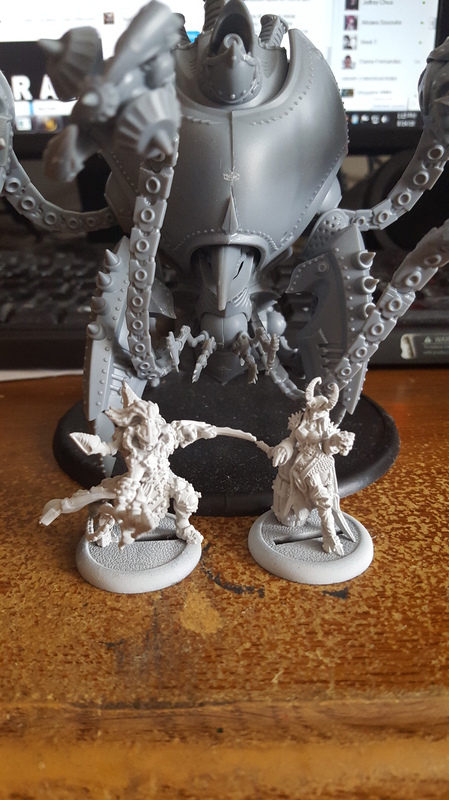 Needless to say, there is actual game to the Seether now with an Iron Lich Overseer, so it isn’t all that bad to show the Seether bits too (plus I know some of you guys love the Seether, and that’s ok!). Finally, everything together! I’ll post a fully built Inflictor as soon as it’s built, but I really wanted to just show you guys that the clock has not been reset! It really is here! Another Gencon has just passed and with that, Gencon ninjas have come through! I said that once Aiakos went full warcaster, I would be all-in on him regardless of how good or bad his rules ended up being, and so, Captain Aiakos is next up in my caster queue of casters to play. In the next few weeks, I will be doing quite a lot of testing with Aiakos to see what makes him tick. There are some obvious weaknesses and he’s going to want every single last bit of focus efficiency he can get but I personally see a very fun caster who can reach out from a long ways out. This is just a quick post to give you guys an update as to what’s coming up next.